It’s time to go shopping… Kurt Geiger and French Sole launch new kids ranges | life.style.kids. So, hearing about not one, but TWO mini launches was enough to get me a teensy bit excited. Firstly, French Sole have expanded their collection of trademark ballet flats to include a range for girls in sizes 27 to 34 – all mini versions of designs from the adult range. Available in classic tones, plus deliciously quirky styles, too, they’re a must for weddings and parties and cost from £75. You’ll have to make a bit of a pilgrimage though as the range is only available in the brand’s Marylebone Lane and Kings Road stores. Hot on their heels, Kurt Geiger have been selling the gorgeously funky Mini Miss KG range since the beginning of March online and in-store, and I LOVE the bold, tongue-in-cheek designs. 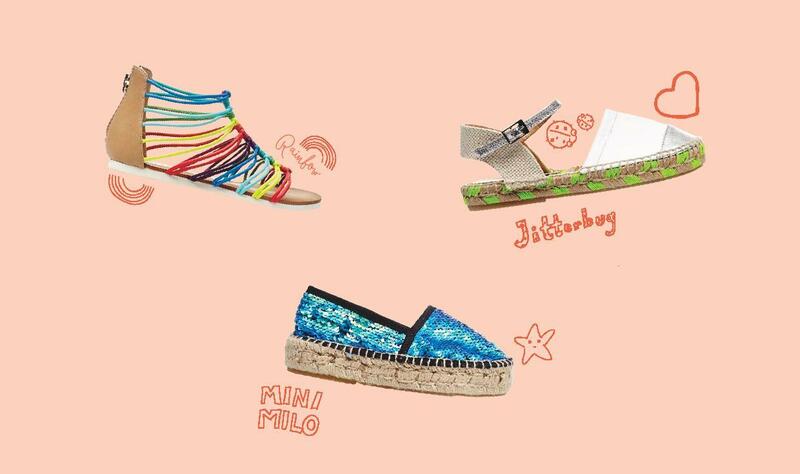 For girl aged 4 to 12, the focus is on scaled-down versions of summer’s key footwear trends – statement espadrilles, sliders and metallic sneakers. Makes you wish you were eight again, eh? Tags: fashion, french sole, girls, kids fashion, kids shoes, kurt geiger, miss kg, shoes. Bookmark the permalink.